Precision Utility Locating (PUL) - Hager-Richter Geoscience, Inc. : Hager-Richter Geoscience, Inc. 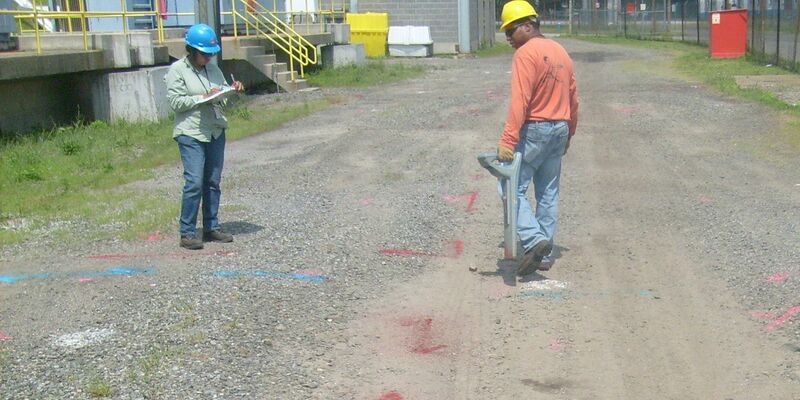 Precision Utility Locating (PUL) is a rapid and cost effective way to detect and track subsurface utilities and is an important element of the Utility Designation phase of Subsurface Utility Engineering (SUE) projects. The locations of utilities can be marked quickly at a site without extensive data processing, and in some circumstances, the depths of the utilities can be approximated. The PUL method is commonly used in conjunction with complementary geophysical methods such as magnetics, EM, and GPR. One advantage of the PUL method is that it can be used successfully in urban areas where surface features such as buildings and overhead utilities prevent the effective use of other geophysical methods. A second advantage is that it works well in areas of conductive ground where GPR does not. The most common type of PUL equipment detects the electromagnetic field produced by the current flowing along a buried conductor, such as a pipe of cable, and uses that field to locate the utility. PUL equipment can be used either in an active mode or in a passive mode. In active mode, a PUL transmitter is either directly connected to a known utility at a surface point or it is used to induce a current on a buried known utility. The PUL receiver is used to trace the signals along the utility. In passive mode, the PUL receiver is used alone to trace signals carried by a utility from local power lines or distant radio transmitters. The passive mode is used to explore areas where no surface evidence of utilities is present. 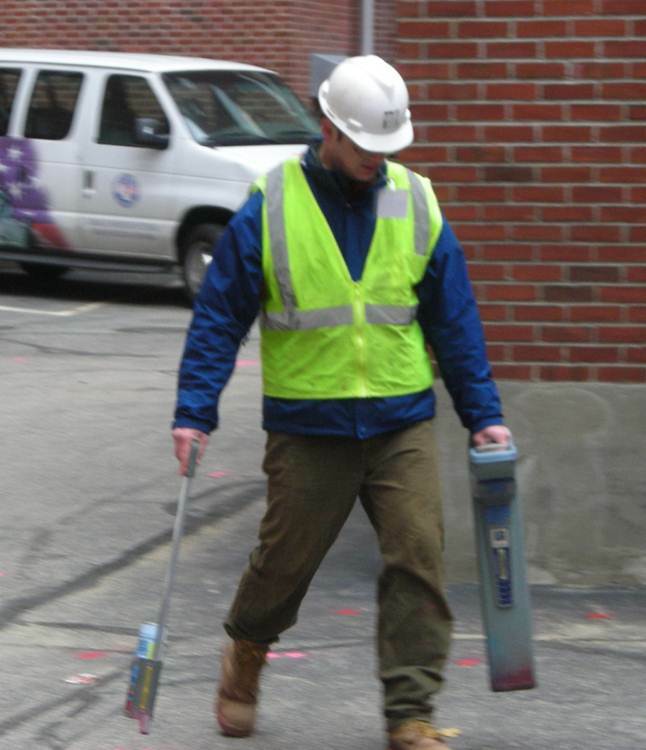 PUL equipment cannot be used to detect non-metallic pipes, such as concrete, vitrified clay, plastic, PVC, or masonry, except in cases where surface access permits insertion of an accessory device to transmit signals. Our diverse experience — we have successfully located active and abandoned utilities on large and small sites, in dense urban settings, along highway rights of way, at airports, at military facilities, and at a variety of industrial and commercial facilities — is available to help design a utility location program to meet your objectives and circumstances. We have the trained staff and a full complement of state-of-the-art PUL equipment, as well as magnetic, EM, and GPR equipment. An 80-acre railroad yard, located in the center of a northeastern city, was to be redeveloped. Dozens of historic and newer buildings, razed buildings, and support structures were present. Available information on location of subsurface utilities was severely outdated. Over the long history of use at the site, subsurface utilities had been added, altered, removed, and some had been abandoned in place. 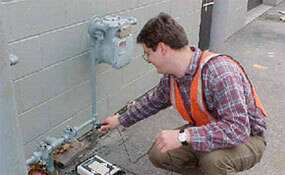 Our objectives were to detect and locate all utilities. The results would be used for the planning and construction phases of the redevelopment project. Hager-Richter sent two field teams to the site. One team used PUL equipment in active mode to map the locations of utilities with surface connections (gas, water, electric, telephone, and sewers). The other team used PUL equipment in passive mode and supplementary EM and GPR methods to explore for subsurface utilities without surface connections. Hager-Richter's work was completed two weeks ahead of schedule and under budget.